Boxing training puts a girl through a series of drills that will test her physical toughness and mental dexterity. Boxing training for girls entails building endurance, building strength, increasing boxing intelligence and solidifying proper boxing technique. A training coach is necessary to learn the finer skills of training for the sport, and so is the realization that people can get hurt badly. Boxing has a large upside for girls who want to begin training or for those who are already involved in training. The most obvious perk of training is that it keeps competitors in outstanding physical condition. Boxing training stimulates all the muscle groups and provides both aerobic and anaerobic exercise. Self-confidence is another benefit of boxing training for girls, as getting through boxing training is a major accomplishment for any person. Boxing is a dangerous sport and training for boxing can put girls in positions to get hurt. Getting punched by other boxers in training exercises can cause bruising and injuries to internal organs. Punching objects and other boxers also puts girls at risk for broken hands, fingers and wrists. Girls who want to get into boxing training need to know the risks of the sport and make sure they are comfortable with them. Boxing is not a sport just for men. Female boxing has seen a large boost in popularity since 1997 and it is socially acceptable for girls to engage in boxing training. The International Female Boxing Association formed in 1997 to promote female boxing as a legitimate profession. 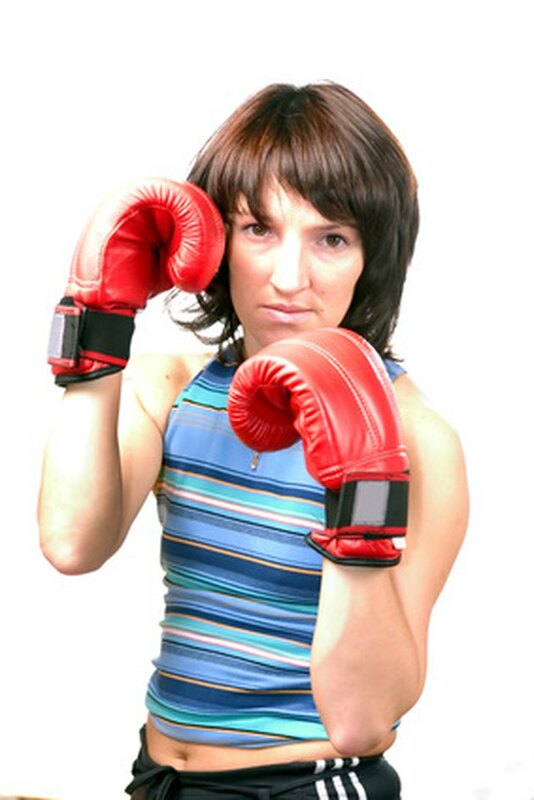 Boxing training options are available to girls at many gyms and the sport is not explicitly made for males. Boxing training for girls has become more common across the world, as there are more competitions being held for females. The 2012 Olympic games in London will include women's boxing, according to Fightnews.com, and the IFBA has been in existence for 13 years. Worldwide organizations and an international competition at the Olympic level show that girls are engaging in boxing training across the world. Boxing training for girls solidifies the thought that gender rules should not prevent females from getting involved in boxing. According to the Sport England organization, the International Olympic Committee's recommendation to include female boxing will make the 2012 Olympic games the first to feature gender equality, with the same number of competitions for each gender. Acceptance of female boxing at the Olympic level is a significant statement that gender equality in sports is encouraged.